When the Tampa Bay Rays dealt Chris Archer to the Pittsburgh Pirates at the trade deadline, they received Tyler Glasnow, Austin Meadows and a third player to be named later (PTBNL). On Tuesday that player was named — right-handed pitching prospect Shane Baz. Baz was Pittsburgh’s 12th overall selection in the 2017 MLB draft and signed for $4.1-million. He has performed to a 3.91 ERA in 20 professional starts (69 innings of work) while striking out 73 and walking 37 (1.97% K/BB). His 26.1% strikeout rate is good, however, his control is shaky. Before coming over the Rays Baz, 19, was ranked fourth in the Pirates prospect system and 95th overall according to MLB Pipeline. The right-hander grades out at an overall 50, and has been lauded for his deep repertoire compared to most young pitchers. According to FanGraphs, he has high marks on his mid-90’s fastball (55/60) and also boasts a cutter (45/60) that he can manipulate to get sliding action, a curveball (50/60) and a changeup (60) which is his weakest option. Baz has a combination of deep repertoire and projection that gives him a very high ceiling. His fastball velocity picked up in his senior year. He’ll sit at 92-96 mph and can reach back for 98 mph, with the ability to run and sink it while not losing velocity deep into his starts. He can miss bats with a plus cutter that he can turn into a true slider, and he also spins a distinctly different curveball. His changeup gives him another potential Major League average pitch. A solid athlete, Baz should be able to find the strike zone consistently as he refines his delivery. Tampa Bay assigned Baz to their Appalachian League team in Princeton, and next season he should be moved to Bowling Green where he can hone his potential for the Rays. While it’s still technically too early to determine who won the trade between Tampa Bay and Pittsburgh, the Rays got Tyler Glasnow, who is already paying dividends, and Austin Meadows, who should be promoted to the big leagues in the near future. The Rays also got a high ceiling player in Baz, who could impact the team down the road. Meanwhile, the Pirates received Chris Archer, who has relinquished nine runs on 18 hits and six walks over 14-1/3 innings. I’ll let you decide. The Tampa Bay Rays scored five first inning runs, and held leads of 5-0, 7-3 and 9-7. Yet after losing a two-run lead late in the ball game, the Rays scratched across a 10th inning run, allowing them to walk it off against the Detroit Tigers, 10-9. Tampa Bay starts the day two games over .500 — equaling the team’s high-water mark — having gone 12-1 in its last 13 home games. Chris Archer got the start for Tampa Bay, his first since June 5, and instantly found himself in trouble in a long, 25-pitch first inning. Archer allowed the first two batters to reach via a leadoff walk and a single, although he worked around the jam by coaxing a ground ball out, sandwiched between a pair of swinging strikeouts. Meanwhile, all nine Rays batters came to the plate in a five run first against Francisco Liriano. Matt Duffy started the rally with a one out single off the glove of sliding centerfielder, Victor Reyes. Daniel Robertson and Wilson Ramos followed with back-to-back singles to load the bases before CJ Cron — who is slashing .500 BA/.545 OBP/.900 SLG/1.445 OPS with a .400 ISO in the month of July — lashed an RBI single to left. Jake Bauers drove in the second run on a 3-6 fielder’s choice with Robertson crossing the plate. The inning probably should have ended on the next play, but a little bit of Tropicana Field’s serendipitous magic allowed Adeiny Hechavarria’s pop fly to right to get lost in the lights as it fell in front of Castellanos, allowing two runs to come across on what was scored a double. Carlos Gomez followed with a run-scoring hit to left, capping the five-run rally. Archer worked around more traffic on the base paths in the second inning, but gave up three runs in the third when Victor Reyes and Ronny Rodriguez singled, and Nick Castellanos walked, loading the bases. Niko Goodrum doubled to right, driving in a pair before Archer retired the next three batters (although Jim Adduci was able to push across another run on a ground out) to end the frame. Archer did receive a little help from INF/OF Daniel Robertson, who laid it all out to end the frame with a diving grab. Be that as it may, the Rays got two of those runs back against Liriano. Ramos led things off with an opposite field homer, on a fastball that caught too much plate. Rod Gardenhire had seen enough of Liriano, and pulled him from the game after Cron doubled to left and Hechavarria walked. With two on and one out, reliever Drew Ver Hagen appeared to get an inning-ending double play off the bat of Gomez, but the ball took an awkward hop off the second base bag for a run-scoring double, pushing the lead to four. Archer, who was on a pitch count, again took the mound in the fourth, although he was lifted with one out and two on after throwing 78 pitches. He gave up six hits and two walks, while fanning three. Hunter Wood came on in relief and settled things down for a bit, tossing 2-2/3 innings of scoreless baseball. His fastball has got some late life. He looked fearless (confident) throwing it in the zone. Seesaws are going to seesaw, and the lead got away in the seventh inning with right-hander Jamie Schultz on the mound. Schultz allowed a free pass to Rodriguez, hit Castellanos, and allowed a run-scoring double to Niko Goodrum, all in the span of 16 pitches. With the lead in jeopardy, Adam Kolarek entered the fray and threw one pitch to Victor Martinez, who lined a ball to right-field which Gomez caught for the first out. Gomez threw a bullet to the home plate that would have gotten Castellanos for the second out … had Ramos held onto the ball. Diego Castillo entered the game and got pinch-hitter John Hicks to pop out to first, however, the right-hander walked former Ray Mikie Mahtook and hit James McCann to load the bases. Jose Iglesias proceeded to line a game tying, 1-0 double to left. Tampa Bay reclaimed the lead back in the bottom of the seventh against Louis Coleman, because seesaws are going to seesaw. Cron led off the inning with a double to right, his third hit of the night, before Jake Bauers singled Johnny Field, who pinch-ran for Cron, to third. After Hechavarria lined out to second, Gomez laid down a perfectly placed bunt single toward third, allowing Field to score. Pinch-hitter Joey “he can hit” Wendle connected for a double to right, with Bauers crossing the plate to put the Rays up by two, but Gomez was thrown out at third, ending the rally. And in true seesaw fashion, Detroit scored two runs in the eighth inning, again tying the game. Ryne Stanek started the frame by coaxing a popper to right from Rodriguez for the first out, but followed by allowing a double to Castellanos. Jose Alvarado entered the game and got Goodrum to ground out on the first pitch of the at-bat, but V-Mart hit an RBI single to draw Detroit within one. Closer Sergio Romo was summoned from the bullpen to get the final out of the eighth, but quickly gave up a first pitch single to John Hicks, allowing Martinez to move into second. It then looked like Mahtook on a would be ground out softly wide of first, but Bauers fielded the play and responded by throwing the ball well over the head of Romo, who was covering the bag, and into the Rays dugout. The error allowed pinch-runner Jacoby Jones to score the game tying run. Romo finished the eighth and pitched the ninth as well, retiring the final four batters he faced. After Matt Andriese threw a scoreless top of the tenth, Tampa Bay rallied against Blaine Hardy, who threw a zero up in the ninth. Wendle led off the frame innocuously enough with a ground out to short, yet Kevin Kiermaier tripled to left-center with one, putting the winning run just 90 feet from home plate. Duffy, the next batter, quickly fell behind 0-2, although he inevitably worked a nine-pitch at-bat before he drew a walk. Robertson proved to be the final batter of the game, and after he squared around to bunt on the first pitch of the at-bat, he lined a ball through the middle, giving the Rays a walk off victory. Robertson ended the night with three hits, as did Gomez and Cron, and the Rays collected 18 in total. The Rays play game two of the series on Tuesday with Matt Boyd (4-7, 4.58 ERA) starting for Detroit, pitching opposite of the bullpen for Tampa Bay. Ryan Yarbrough (7-4, 3.75 ERA) is expected to throw the bulk of the innings since Andriese pitched Monday night. Golly, look at all them buildings lit up! I didn’t think it could be physically possible to do that! Look at that one! …Gasp… Look at that one! Gosh glorifying us with his magnificent fluorescence! — Your requisite reminder: The Rays are now 29-1 when they score at least five runs. More hurdles for the Hillsborough County Commission, who seeks to bring the Tampa Bay Rays to Ybor City. On Wednesday, Steve Contorno (Tampa Bay Times) reported that Americans for Prosperity (AFP), a conservative advocacy group funded by David H. and Charles Koch, began running video ads urging Hillsborough County residents to oppose the use of tax dollars for a new stadium for the Tampa Bay Rays. According to the article, AFP — who also has launched similar advocacy campaigns in other cities where sports teams seek public funds for new stadiums — aims to draw a line in the sand as discussions continue between local government officials and the Rays to ensure no taxpayer money is used to woo the team from one side of the bay to the other. The team has proposed the building of a new stadium in Ybor City, yet no financial details have been made publicly available. The estimated cost of a new stadium is somewhere between $500-800 million, while Rays Principal Owner Stu Sternberg has committed just $150-million to the project. Our business isn’t able to fund a ballpark on its own, Auld said. Our debt payments would hamstring payroll and we wouldn’t be able to put a competitive product on the field. There is absolutely a reasonable argument to be made that’s not where this community wants to put its dollars. We’re going to make our case that we think it does have a positive return, that a new ballpark can lead to a higher tax base that can fund a whole bunch of other services in the area. But it’s not an easy case. It is unlikely that Hillsborough County commissioners would propose a tax increase that would necessitate a public referendum, which likely is the catalyst for AFP’s entry into the fray. Ken Hagan, the Hillsborough County lead on the discussions with the Rays, has not been transparent in his dealings with the team, and famously championed the secretive deal which bought the Atlanta Braves a new home in Cobb County. It’s the perfect model for what we’re trying to do here, Hagan said in a June 2017 interview with Sports Talk Florida. (Come up with) a financing plan that the development can help pay. Yet the same funding apparatus advocated by Hagan has caused a major a budget shortfall of $30 to $55-million, forcing Cobb County officials to raid $21 million in rainy-day funds to plug the gaping hole in the 2018 budget. Neil deMause (Field of Schemes) also found that Cobb County is looking at just $5.2-million in new revenue from the new facility, for a return on investment of at least negative-80% — less than a 60% annual profit. The digital ad is reportedly only the start of the campaign. Americans For Progress is prepared to use the Koch Brothers money to launch phone banks and radio ads, and to send out mailers to further encourage Hillsborough County residents to pressure their politicians. AFP’s efforts could still influence funding decisions if Hillsborough County commissioners believe there will be a political cost to supporting publicly funded stadium subsidies. St. Petersburg has proposed the building of a new stadium in an effort to keep the team, by similarly using money from the existing bed tax or new development on public land. There is a difference, however: Pinellas County has already accrued a substantial amount of money through the current bed tax mechanism, and isn’t considering any new taxes. — Hour 20 without electricity. Thanks a lot Irma and Duke Energy. Hopefully we get a lot of Lucas Duda fans. I don’t know if there is a neutral site when you’re playing the Yankees. — You can read about tonight’s pitching matchup, and so much more, in our series preview. The Tampa Bay Rays did not have a good season in 2016. In fact, the Rays have not made the American League playoffs since 2013. They did make it to the AL Division series that year, losing to the eventual World Series champions the Boston Red Sox. Since that time it has been some lean years for the Rays with three consecutive losing seasons, culminating in 2016’s record of 68 wins and 94 losses, their worst record since 2007. This year the Rays have rebounded from last years debacle and are playing decent baseball again. Their record of 59 wins and 61 losses as of August 14th is a big improvement over last year’s 47 and 69 on the same date. They are currently only 2.5 games behind qualifying for a wild card playoff berth and have a legitimate shot at making it to the playoffs for the first time in 4 years. They bolstered their roster at the trading deadline, making some moves that they hoped may help in the stretch drive to the end of the season. While it is too soon to tell if these moves will pay off, the fact that the team is in a position to trade for players in an attempt to win this year is a testament to the team they fielded at the start of the season. Third baseman Evan Longoria and starting pitcher Chris Archer are having serviceable years but several Rays that were on the opening day roster have improved their performance over last year. In some cases they are having the best season of their Major League careers. Let’s take a look at some players that have been instrumental in the Rays’ return to competitiveness. Corey Dickerson was obtained by the Rays in trade with the Colorado Rockies prior to the 2016 season. He was coming off an injury plagued 2015 season in which he only appeared in 65 games. He had a decent year in his first with the Rays, hitting .245 with 24 home runs and 70 RBI. Determined to improve on that performance and fulfill his high self-expectations, Dickerson changed his diet and cut his weight down to 200 pounds for the first time since being drafted in 2010. He believe this gives him a better jump on chasing fly balls and allows him to stretch more singles into doubles on the base paths. The formula seems to have worked for the left fielder and designated hitter. He has played well as the Rays’ leadoff hitter and earned the fan’s votes to become the starting AL designated hitter in the 2017 All-Star Game. He is on his way to a career best season in the power department already accumulating 22 homers and 27 doubles. His previous high for home runs was 24 in 2014 and 2016 and he should easily surpass those numbers if he remains healthy. Dickerson is also on pace to shatter his previous record for hits in a season which stood at 136. He currently has 131 hits and has raised his batting average from .245 last year to .285 in 2017. Corey is definitely one of the reasons that Tampa is in the playoff hunt this year. Morrison was also obtained by the Rays in the 2015 off-season. It was hoped he would be the starting first baseman but Logan was hampered by arm and wrist injuries in 2016 limiting his productivity. Fully recovered from those ailments, Morrison is on pace to have his best hitting year since becoming a Major Leaguer. His 28 home runs blows by his previous best of 23 in 2011 when he was with Florida. That was also his most effective RBI season with 71 and he already has 67 this year with over 40 games left to play. Logan’s slugging percentage currently stands at .512, more than 50 points higher than in any previous season. Morrison has also played a part in the Rays’ resurgence by his base running prowess. Though the first baseman will never be thought of as a stolen base threat, the Rays are one of the best teams in baseball when it comes to taking an extra base on a hit. He leads the team in the statistic called ultimate base running. This stat calculates the value of taking an extra base versus getting thrown out in the attempt. Morrison has the best numbers here, getting good reads on fielders and hustling for the extra base. These kinds of plays can be instrumental in a team’s success and Morrison is leading by example. Steven Souza Jr. has been on the Rays since 2015. He is the starting right fielder and pre-season expectations were that he would have an average year. His offensive production has exploded this season. Souza Jr. has already accumulated 25 home runs, 18 doubles, 62 walks and 71 RBI. With about a quarter of the season left to play, numbers all exceed Steven’s previous best totals. His batting average of 259, OBP of .365 and slugging percentage over .500 are all career bests. Remaining on his current pace, Souza Jr. projects to hit 34 home runs and drive in 96 this year. Considering the fact that his previous highs in the categories were 17 homers and 49 RBI you have to put him up near the top of the list when reflecting on the Rays’ improved team performance this season. 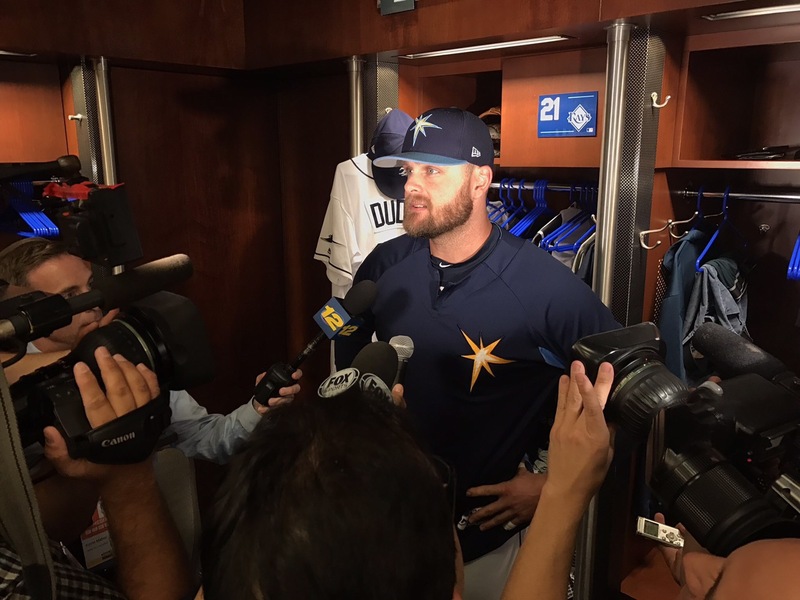 Journeyman reliever Tommy Hunter signed a minor league contract with the Rays before the start of the 2017 season. His work in spring training earned him a spot on the big league roster for the start of the season. Despite missing a month with a calf injury early in the season he has been a bright spot in the Rays’ bullpen. He is not the closer and has only one save this year but has contributed 14 holds keeping his team in the lead and setting it up for closer Alex Colome. Hunter has accomplished this with some startling numbers compared with his previous season in MLB. His strikeout per 9 innings is at all time high of 9.66, almost a full strikeout per 9 better than his 2015 campaign. Tommy is sporting the fourth best ERA among American League relievers at 1.76 which is a tremendous improvement on his career numbers which stand at 4.12. The 9 years veteran of the Major Leagues may well have found a home in Tampa. Combining the great years being put up by these 4 players, the steady work of Longoria and their starting pitching has given Rays fans hope for both this year and the future. Pre-season projections had the Rays finishing out of the playoffs for another year. They have shown once again that projections are often not worth the paper they are printed on as they make a late season drive to secure a wild card spot and play well into October. Author Bio: I’m David, the editor/co-founder of The Planet Of Baseball. Being a software engineer by day and a baseball blogger by night, I also participated in the training activities of a youth baseball team at my hometown. I have a huge passion for baseball, it pertains to my life from childhood until now. So, I’m here to share with you all things about this passion. Hope you find this helpful.